Just before, during, and after Hurricane Sandy hurled herself against the East Coast, frequent Twitterer Christiana Figueres ’79 was out in front with other “top people” (including Michael Bloomburg, Nicholas Kristof, and Al Gore) who use Twitter’s hash tag #Climatechange. 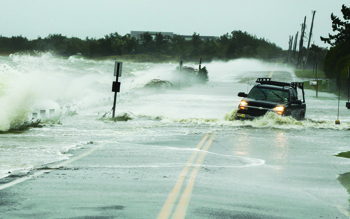 “Makes severe weather events more frequent and more intense. What part of that do we not understand?” Figueres tweeted on Nov. 1. Using social media to get her message through to the masses—particularly young people—worldwide is central to the United Nations climate chief’s mission. She brought her buzz to her alma mater Sept. 24 in a more traditional manner—meeting her audience face to face in a packed auditorium. Although it had been three decades since Pieter Judson ’78, Isaac H. Clothier Professor of History and International Relations, first met Figueres, his perception of her “wicked sense of humor” back in the ’70s is still dead on. Early in her talk about the need to critically address global climate change, Figueres shared a story from her student days: She and her sophomore roommate and enduring best friend Madeline Barillo ’78 showed up at 5:30 a.m. on Easter at then-President Dorie Friend’s house in bunny costumes. Perplexed at having never been invited to his house, as many of their fellow students had been, they’d taken matters into their own paws. 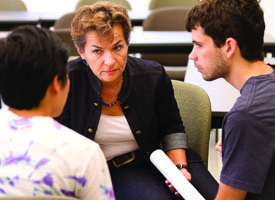 After her audience’s laughter subsided, Figueres urged the students and faculty from across academic disciplines as well as community members and scholars from area institutions not to wait for an invitation to take action on climate change. While Figueres stressed being aware of one’s own contributions to environmental impacts, she confessed her own transgressions, saying her husband and two daughters often have reminded her to turn off lights when leaving a room and questioned the sustainability of her modes of transport. Besides her references to the College’s influence on her life, Figueres also mentioned the impact her father, José Figueres Ferrer, had on her commitment to serving the greater good. Of her father, a three-time president of Costa Rica, she said, “He was a revolutionary leader, who led the Costa Rican revolution in 1948. I’m proud of the social change that that revolution brought.” From him, she received her values, inspiration, and principles to live by. That an expected 100 million to 400 million people are predicted to become refugees due to climate change during the next 20 to 30 years is ever on her mind. “All of these people are the least responsible for climate change,” she noted. While her father may have motivated her quest to advance social change for the common good, her mother helped to raise her sensitivity to the natural environment. She took Figueres to a national park in Costa Rica as a small child, where they encountered the small, shiny, golden toad. This shift came after an early career in public service with the government of Costa Rica, both in her home country and with the Costa Rican embassy in Bonn, Germany, where she still lives with husband Konrad von Ritter, recently retired as manager of the sustainable development unit at the World Bank Institute. In 1995 Figueres founded and became the executive director of the Center for Sustainable Development of the Americas, a nonprofit organization dedicated to promoting the participation of Latin American countries in the U.N.’s Framework Convention on Climate Change. That year, Figueres became Costa Rica’s climate-change negotiator. Fifteen years later, she was tapped to be the U.N. convention’s executive secretary, a high-profile post that keeps her traveling nonstop. 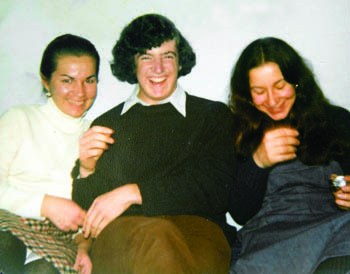 Figueres (left) traveled to Munich in the mid-’70s to visit her roommate Madeline Barillo ’78 (right) who was on a study-abroad program also attended by Pieter Judson ’78 (center). She proved that during her jam-packed day, racing around campus in her brown high-heeled boots to meet with student groups, biology and environmental-studies students, and faculty. After her formal talk, she met with student activists, leaning forward and listening, razor-sharp eyes on their faces. Passing on to the younger generation her passion for redressing climate change is a strong focus of her job as climate chief, and she urged students to attend the U.N.’s late-2012 Climate Change Conference in Doha, Qatar. Back then, Barillo also witnessed her best friend’s intensity on many occasions, including during one of Figueres’ frequent visits with a group of native people in a remote part of Costa Rica. 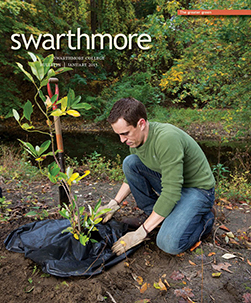 Her interest in the group had led Figueres to pursue anthropology at Swarthmore, and Barillo expected her to return to that remote group after graduation. 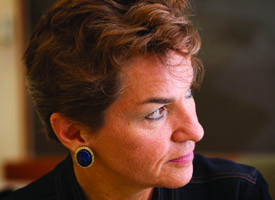 The switch in focus to climate change was somewhat unexpected, but Barillo always knew Figueres would apply her trademark fierce determination to whatever cause she embraced. You can listen to Figueres’ talk on campus here.